Hossam Abou El-Regal, who was allegedly dead after being brutally beaten Saturday at the hands of police officers who accused him of killing a colleague in Upper Egypt’s city of Beni Suef, has disappeared from Beni Suef Hospital where he was transferred after the attack. According to an official at the hospital, around a hundred armed "outlaws" broke into the hospital Saturday night and took Abou El-Regal after they were told that he was in a coma and had not yet died. Meanwhile, family of Abou El-Regal are accusing police of being behind the kidnapping of their son for whom they have no confirmation whether he is alive or dead. Abou El-Regal was arrested Saturday by several police officers and others in an apartment in Beni Suef. They then took him to the funeral of slain officer Captain Hisham Abou Tama where he was tied down in a mini-truck and beat to death as tens of mourners watched. 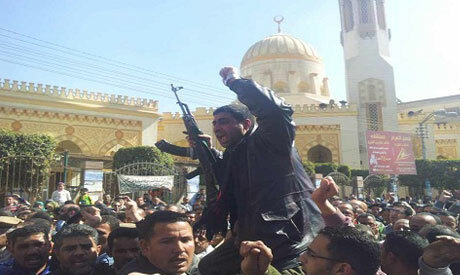 The assault on Abou El-Regal allegedly took place in the presence of senior security and political officials in Beni Suef who were leading the procession, including General Ahmed Shaarawi, the governorate's security director, and Maher Beybers, Beni Suef governor.